Continuing the three month non-series The 2016 Views Summer of Absolute Awesomeness! Every episode in June, July and August will be in some, way, shape, form or fashion remind me of reading comics in the summer! Big events! Books I read during the summer! Stuff that's just a lot of fun! That's what this non-series is all about! The calendar says it's June so that means it's time for Views' annual anniversary episode! 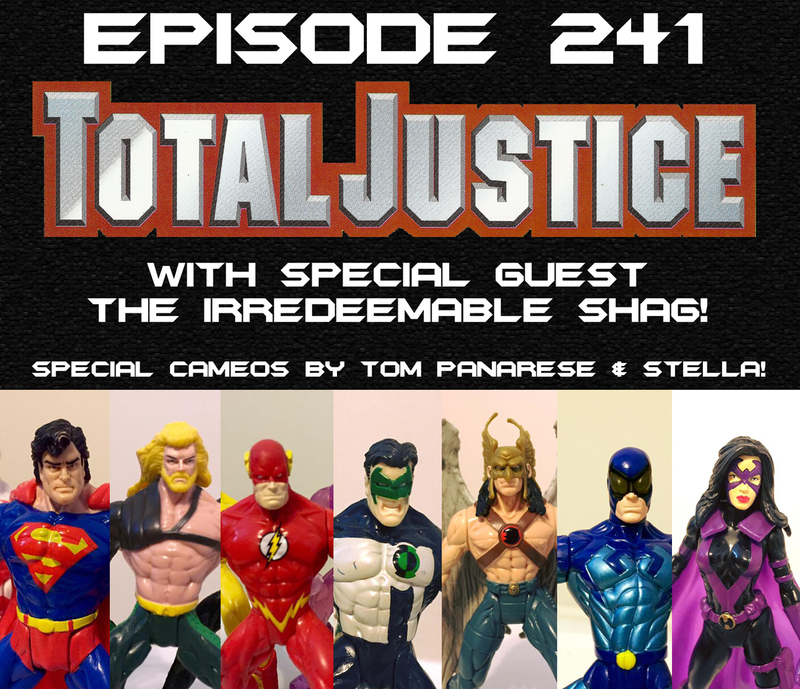 As usual The Irredeemable Shag (host of the Justice League International: Bwah-Ha-Ha Podcast and co-host of The Fire and Water Podcast) is with me and our topic this year is total team work, total tech...TOTAL JUSTICE! Twenty years ago Kenner Toys put out a line of action figures based on the DC heroes with the added hook of FRACTAL ARMOR! What is FRACTAL ARMOR? You'll have to listen to the episode to find out. You'll also hear Shag and I go through EACH AND EVERY FIGURE of the line as well as EACH AND EVERY FIGURE of the follow up JLA line. But that's not all! Between each segment you'll get to hear all of the songs from the Total Justice: The Ultimate Weapon audio drama that came out as part of the merchandise associated with this line. Maybe audio drama isn't the best way to describe it. Maybe pseudo rock opera is a better description because this thing is your typical JLA vs Darkseid story mixed with a bunch of songs that were mostly nineties rock but there was some hip hop mixed in there as well. These songs are insane and because of that I have to share them with you. BUT THAT'S NOT ALL! For one of the talky talk segments Shag and I are joined by Tom Panarese (host of Pop Culture Affidavit and In Country) and Stella (host of Batgirl to Oracle: A Barbara Gordon Podcast and co-host on several of The Batman Universe shows) to talk specifically about the audio drama. Stella and Tom are an added bonus for this anniversary episode with no increase in the cover price of the show! During the episode Shag mentioned he had 12 Aquaman figures from this line. Here's a picture of those figures which can also double as a snap shot into the mind of an addict. I'd like to thank Shag, Stella and Tom for joining me on this episode and as usual for these anniversary shows I'd like to thank all of you for listening to Views. I have been extremely blessed with a very loyal audience that has stuck with me through multiple weeks and months with no episodes and I hope you've been enjoying 2016 because I've managed to get new episodes out on a regular basis. It means a lot that people want to hear me and my friends ramble on about funny books. Next Time: Haven't decided yet but it is bound to be a lot of fun. Continuing the three month non-series The 2016 Views Summer of Absolute Awesomeness! Every episode in June, July and August will in some way, shape, form or fashion remind me of reading comics in the summer! Big events! Books I read during the summer! Stuff that's just a lot of fun! That what this kind of, but not really connected series of episodes is all about! Welcome to another installment in my series of episodes marking the 20th anniversary of Marvel's Heroes Reborn initiative. This time out the Armored Avenger gets the spotlight and since I know very little about Iron Man in general I have a special guest to pick up that slack. Joining me is Luke Jaconetti (host of Earth Destruction Directive and co-host of Vault of Startling Monster Horror Tales of Terror, both available through the Two True Freaks Network) who is quite the fan of the cool exec with a heart of steel. 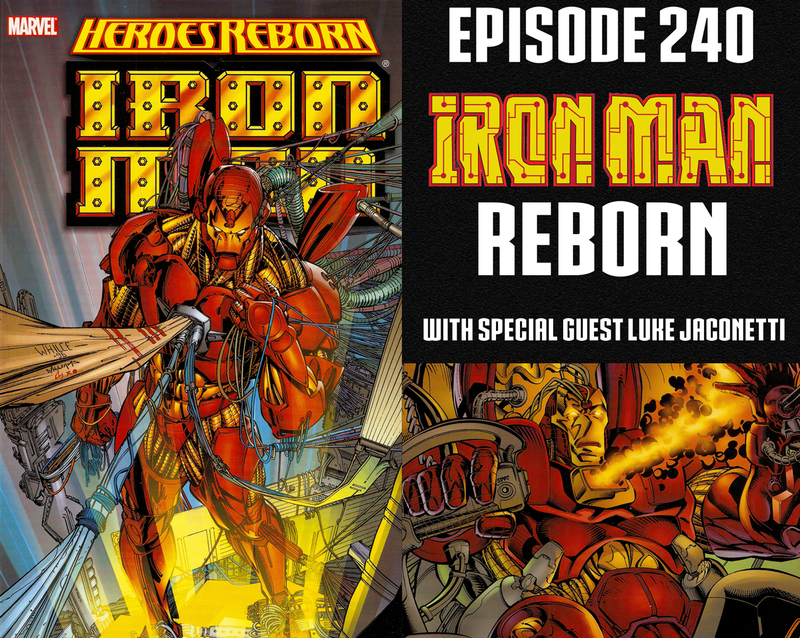 Together we take a close look at the first six issues of the Heroes Reborn Iron Man series and discuss the new origin, the inclusion of the Hulk characters into said origin, the team-ups with the other Heroes Reborn heroes and our opinions on the villains that this "new" Iron Man faces. Other topics include the similarities between this initiative and the Ultimate brand that Marvel would begin less than ten years later, how the Mandarin in this books has a lot in common with the Mandarin from Iron Man 3, how weird it is that a series of stories can feel like they are moving forward and still marking time until the next creative team comes on the book and even some movie talk right there at the end. Be sure to check out Luke's show via the links in the previous paragraph. This episode was a lot of fun to do and we had so much extra audio that at some point I am going to put out a "shoot the breeze" type episode where we talk about fandom and a whole bunch of other random topics. I don't know when I will be getting to that but I'll have it out before the end of the year. Next Time: It's the 9th Anniversary show, which means that the Irredeemable Shag will be dropping by as well as a few other surprise guests. Our subject? TOTAL JUSTICE! Beginning the three month non-series The 2016 Views Summer of Absolute Awesomeness! Every episode in June, July and August will in some way, shape form or fashion remind me of reading comics in the summer! Big events! Books I read during the summer! Stuff that's just a lot of fun! That's what this kind of but not really connected series of episode is all about! Since fan first met fan the question of, "Who would win in a fight? (Insert hero name here) or (Insert other hero name here)?" has been asked again and again. In 1995 DC and Marvel threw that question out to their readers and the result was part crossover, part high school election and all slugfest. DC vs Marvel/Marvel vs DC pitted hero against hero with the audience picking most of the winners. It was a mega-brawl with the fate of both universes at stake. 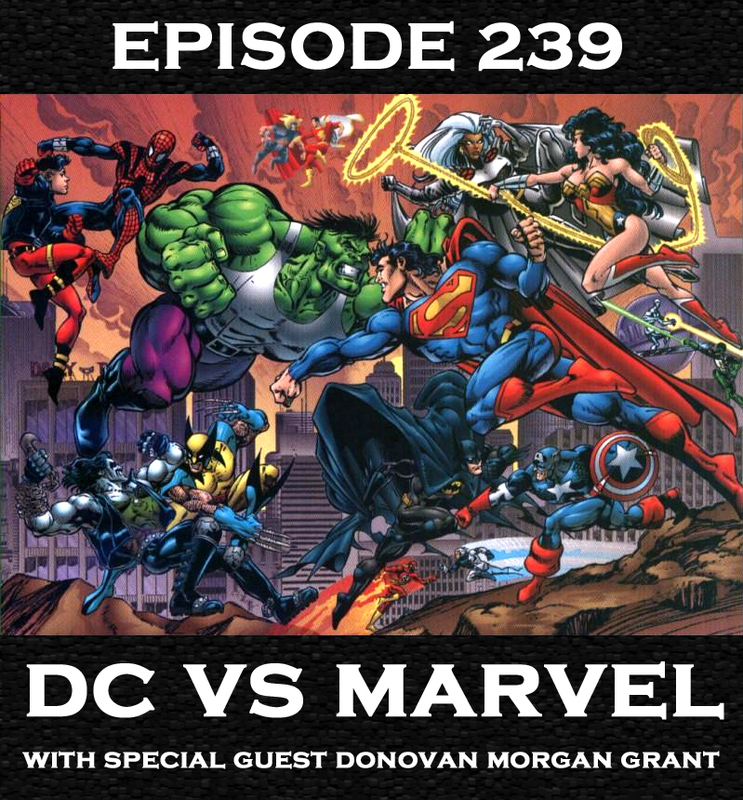 Joining me to discuss this series is Donovan Morgan Grant. Together we talk about the plot (such as it was) but mostly we gush about the fights. Thor vs. Captain Marvel. Aquaman vs. Namor. Flash vs. Quicksilver. Jubilee vs. Robin. Green Lantern vs. Silver Surfer. Catwoman vs. Electra. Wolverine vs. Lobo. Spider-Man vs. Superboy. Wonder Woman vs. Storm. Superman vs. Hulk. Captain America vs. Batman. Don and I go through all of the fights as well as the other fun crossovers and meetings that made this series the epic time capsule it was. We even talk about the Dr. Strangefate Amalgam Comic just for grins and because it was in the trade paperback. Who did we think should have won? What lessons did we learn from this crossover? Was it all worth it? Don and I ask and answer those questions and more. I'd like to thank Don for coming on this episode. He was my one and only choice for this topic because anyone that refers to DC vs. Marvel as "My Secret Wars" (the original one, not the more recent version) has obviously got some things to say about this event. Don is the co-host of The Comic Revue Podcast and the now done and dusted The Next Dimension: A DragonBall Z Podcast so be sure to check those shows out and give them some love. Unless you already are in which case...carry on. One more thing before I sign off for the week. The folks that make up the DCTV Podcasts network of shows are coming together for an event that supports a very worthy cause. I'd tell you all about it but they have a fancy press release so I'll let that do the talking. DC TV PODCASTS: SPINAL CORD RESEARCH FUNDRAISER ON JUNE 11! Podcasters assemble to help cure spinal injuries in a live marathon event. Tuesday, May 31, 2016 - The DC TV Podcasting Network is teaming up with the Christopher & Dana Reeve Foundation to help cure spinal cord ailments on Saturday, June 11, 2016. Be sure to check out the main site and give if you can. Next Time: Another installment of the Heroes Reborn series I'm running this year. Come back next week for a 1996 updating of the cool exec with the heart of steel.